Deacon John G. Boyle, a retired permanent deacon of the Archdiocese of Philadelphia, died March 3 at his home due to complications from COPD and emphysema. He was 74 years old. Deacon Boyle was ordained June 11, 2006 at the Cathedral Basilica of SS. Peter and Paul by Cardinal Justin Rigali. He was assigned to Holy Name of Jesus Parish in Philadelphia and had served there actively until he retired for health reasons on Oct. 30, 2016. 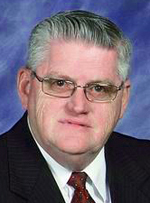 Deacon Boyle retired in 2007 from the Internal Revenue Service. For the past 48 years, he was married to the former Anne M. Meir. In addition to his wife, Deacon Boyle is survived by a daughter Anne, two grandchildren, his twin sister, Dominican Sister Joan Boyle, and one other sister. The funeral Mass was celebrated March 8 at Holy Name of Jesus Church in Philadelphia. Auxiliary Bishop John J. McIntyre was the main celebrant and celebrants included Fathers John Sibel and Francis P. Groarke, who was also the homilist. The deacon of the Mass was Deacon John J. DuBois. Deacon chaplains were Deacon Michael G. Conroy and Deacon Joseph W. Lonergan.